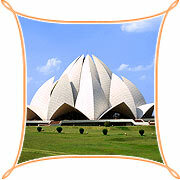 It is a very recent architectural marvel of the Bahai faith, located in Kalkaji, south of Delhi. Shaped like a half opened Lotus flower, this temple is made of marble, cement, dolomite and sand. It is open to all faiths and is an ideal place for meditation and obtaining peace and tranquility. Bahai's Temple is a marvel of modern architecture, which is visible from several spots in south Delhi.